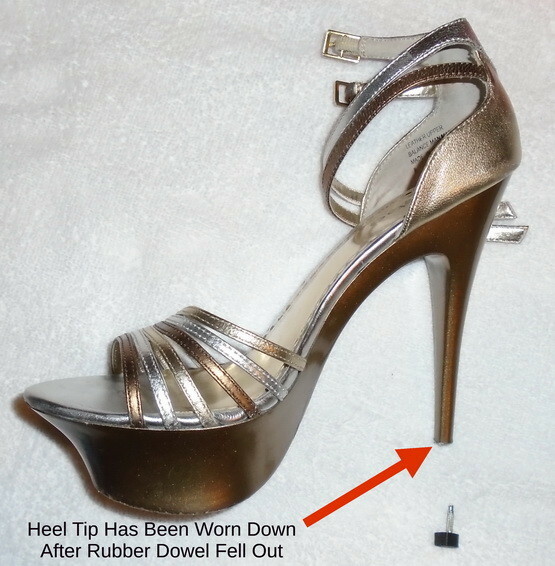 One of the biggest faults of high heels is an easily broken rubber heel tip. 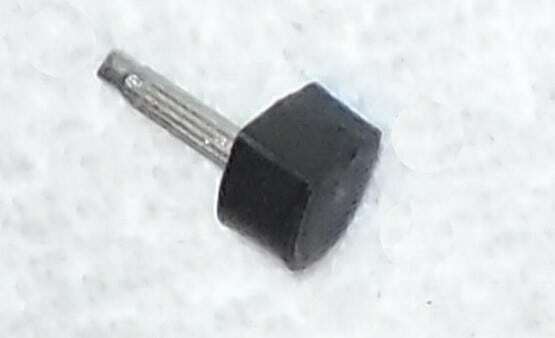 These rubber heel tips are compressed into the end of the heel by using a metal dowel. 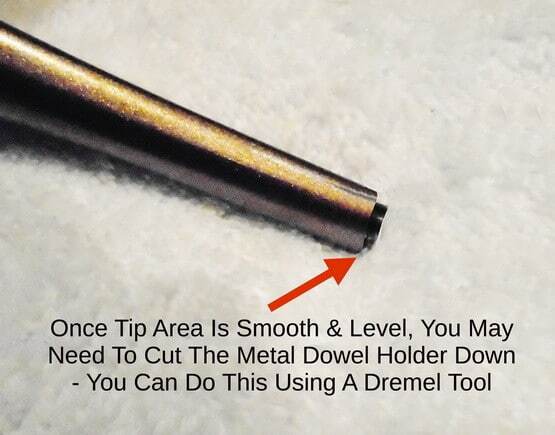 At times either the rubber tip falls off or the whole metal dowel falls out. When this happens, you need to replace the heel tip before wearing them. High heel rubber tip has fallen out of the heel – The shown tools are used to repair. 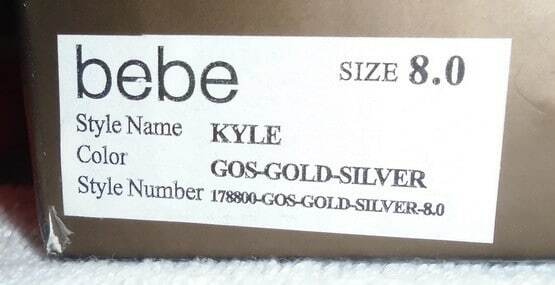 For reference, these are BEBE KYLE style high heel shoes – Gold/Silver color. Lay down a large towel before you begin repairing your heels so you do not damage them further. 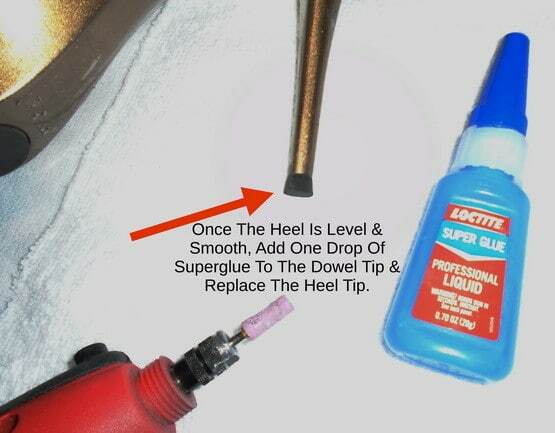 You will need to purchase “High Heel Rubber Tip Replacement Dowels” before fixing your heels. 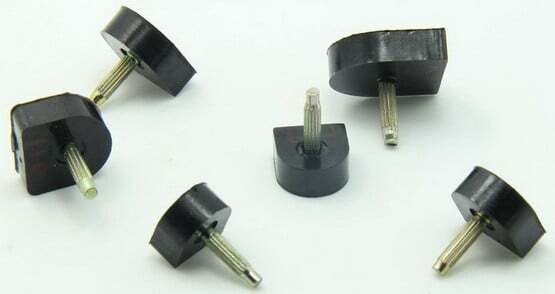 There are many different sizes and lengths of heel rubber tip replacements available. 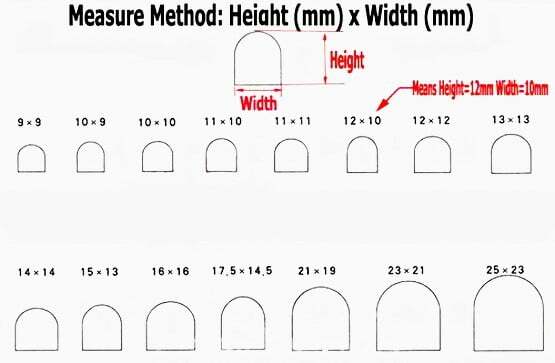 To help you to determine the high heel rubber tip replacement size you need in mm (height and width). This particular heel has been walked on after the rubber tip has fallen out. 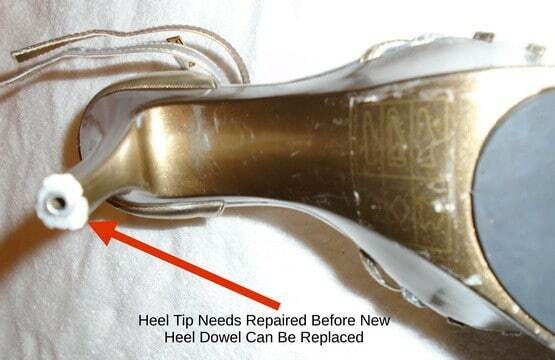 You will need to repair the damaged heel tip before replacing the rubber tip. 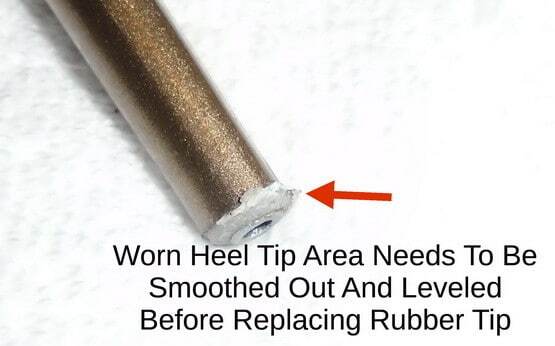 You can first try to fix the damaged heel tip by removing some of the material with a blade. tip area, the dowel holder in the heel may be sticking out just a bit. 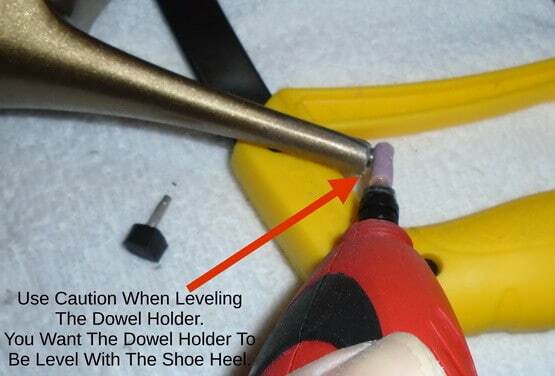 We used a Dremel tool to grind down the dowel holder to be level with the bottom of the heel. 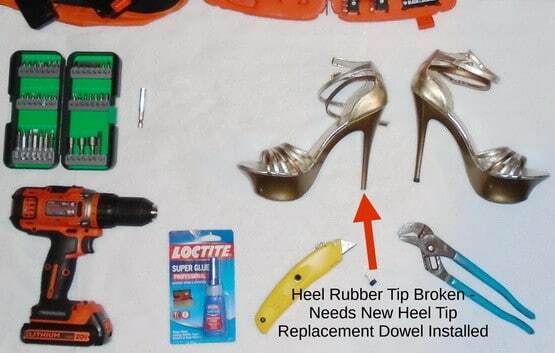 If you know of a better way to repair a pair of high heels, please leave a comment below to help our other readers who need DIY tips. I am looking for replacement caps for woman’s shoe. It has two pegs and is about 2 inches by 7/8 inches. Do you have any suggestions on where to find something like that — most sites only show stiletto caps with one peg. I need square and other shaped tips. Who supplies these please. ..
What type or brand of dress boots do you have? This will be needed for what type of replacement caps or dowels you will need. We understand you need large square or rectangle dowels for your dress boots, so with the exact shoe or boot known, we can direct you in the right direction. Wouldn’t grinding down the one side just make them uneven since you didn’t grind down the other side? 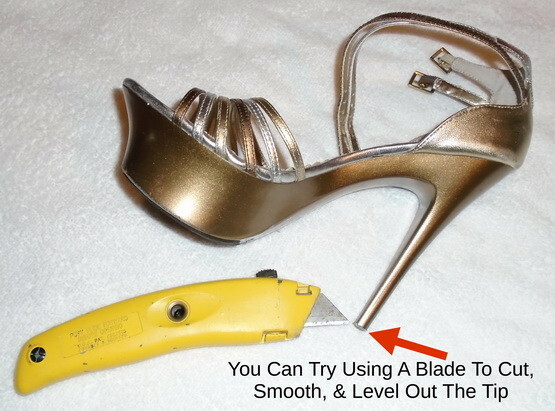 Grinding down a small amount of the high heel shoes to get the tip smooth and level only removes a few mm. Once the rubber tip is in place, the heels are even if you use the correct rubber tips. It could be shorter by a few mm but you or anyone else would never notice. My wife’s high heels are always breaking, and up to now, we’ve just said that we’ll get them fixed eventually. This was a great showcase of how to fix one of the problems that she’s dealt a lot with. I’m excited to go and figure out if this will work with some of her broken heels. Next post: What Is The Best Way To Attach A Headboard? Wall Or Bed Frame?